Thomas Edgar “Tom” Wheeler is a traitor. Tom Wheeler is a self serving treasonous politician, and is currently the Chairman of the Federal Communications Commission. In a 3-2 vote on February 26, 2015 – the Federal Communications Commission (FCC), under the direction of Tom Wheeler, voted to radically overhaul the way Internet service is regulated. FCC Chairman Tom Wheeler and two Democratic Party commissioners voted to move forward with the rules of what they call ‘Net Neutrality’. The agency’s two GOP-appointed commissioners opposed them. The vote is the result of a lengthy process begun by Chairman Wheeler roughly a year ago, and that process came in the wake of two previous efforts in which the agency’s net neutrality rules were struck down in court. But the end result of the vote was largely set near the end of last year, when President Obama released a statement calling for the agency to implement the strongest possible net neutrality rules. Under the new rules, broadband providers, long classified by the agency as Title I information services, will now be regulated as Title II telecommunications services—essentially making them public utilities, like the phone system. The move is designed to allow the FCC to implement strict net rules limiting how much control Internet service providers (ISPs) can exert over what passes over their networks. Thanks to Tom Wheeler that cast the deciding vote, they mean to control us–all of us, in every imaginable aspect. They will never, ever stop–they’ll keep coming, keep trying every way they can think of to slip the leash over our heads and around our necks one way or another–they will have to BE stopped. The price of freedom is eternal vigilance. This step solves no significant existing problem, but is instead designed largely to fend off hypothetical harms, and gives the government far more power over the Internet in the process. In other words, the move is a “solution that won’t work to a problem that doesn’t exist.” It is a solution, however, that is now in place, and is sure to create some problems of its own. Despite Wheeler’s ties to industry associations, he is expected to reinforce the FCC’s commitment to net neutrality. The Internet is “our printing press” and “our town square.” The framers of America would not be pleased with the FCC’s plan. No one, whether government or corporate, should control free and open access to the Internet. And as American citizens, the ones who will be affected by this, we don’t know what is in it. We’re not allowed to see it. Furthermore, we couldn’t previously get the commissioner Tom Wheeler that we pay to go and testify on the contents of what’s in it. Does that sound like net neutrality? Does that sound like Tom Wheeler with these big corporations don’t have anything to do with anything? I mean, it’s been written by the Obama administration with big corporations and special interest groups. As Ron Paul notes today (February 26, 2015) the FCC is a non-elected federal government agency that has arbitrarily decided — without a vote from Congress or permission from the American people — to regulate the internet. In addition, the move will likely force online broadcasters and websites to provide “equal opportunities for political opponents.” The FCC is not shy about announcing this is what it plans to do. Like the Golden Age of Television, the Golden Age of the Internet will be destroyed by the heavy hand of the federal government. Kennedy’s Federal Communications Commission boss, Newton Minow, was responsible not only for destroying the Golden Age of Television, but also centralizing and placing more power in the hands of the big three television networks, which resulted in “reducing the range of choices in programs” and killing off creativity. Obama and the federal government have bent over backwards to portray net neutrality as a win for the little guy. In fact, despite all the siren warnings about socialism and the FCC by Obama’s opponents, the agency is in the pocket of the telecommunications industry and always has been. 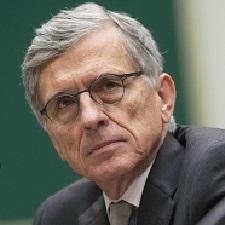 Its current appointed boss, Tom Wheeler, is a former lobbyist for the cable and wireless industry, with positions including President of the National Cable & Telecommunications Association and CEO of the Cellular Telecommunications & Internet Association. “The closer you look at Wheeler’s selection, the more questionable it appears. After being poorly led for more than a decade—particularly under the disastrous tenure of Michael Powell, son of Colin—a strong argument can be made that the last thing the F.C.C. needs is an industry insider with close ties to many of the companies it oversees,” John Cassidy wrote back in 2013 when the White House nominated Wheeler to head up the agency. Net neutrality is a classic Trojan horse. It will be used not only to censor speech and marginalize opposition to the political class, but will also deliver the internet to large and forever consolidating media corporations. In a vote along party lines, the Federal Communications Commission (FCC) approved what amounts to a government takeover of the Internet. FCC Chairman Tom Wheeler and his fellow Democrats, Mignon Clyburn and Jessica Rosenworcel, approved placing the Internet under Title II regulations. The arrogance of Wheeler and his allies has been evident for some time. The 332-page proposal they approved was never made available to the public or Congress prior to the vote, even as Wheeler ignored pleas by Pai and O’Rielly to do so. “We respectfully request that FCC leadership immediately release the 332-page Internet regulation plan publicly and allow the American people a reasonable period of not less than 30 days to carefully study it,” they said in a statement released Monday. Maybe not, but once again Republicans have made it clear they don’t have the stomach for a fight. Despite being virtually assured of yesterday’s outcome, they quietly surrendered, abandoning plans to come up with legislation that would have blocked this power grab. Even worse, they blamed their impotency on Democrats. “The Democrats have been pushed away from negotiating with us,” Senate Commerce Committee Chairman John Thune (R-SD) insisted. He also accused the Obama administration and FCC officials of convincing Democrats not to talk to his party about any proposed legislation until after the vote had transpired. Thune is emblematic of a Republican party delusional enough to believe the party of expanding government would vote to limit that expansion, while he and his fellow GOPers have missed another opportunity to put a bill on Obama’s desk. While it is certain Obama would veto any measures to rein in the FCC, given his statement last November advocating net neutrality, Republicans apparently remain maddeningly unwilling to recognize the long-term political advantages of further defining the president as the constitutionally-challenged statist he truly is. Even their supposed investigations into whether the Obama improperly influenced the FCC’s net-neutrality proposal remain in limbo. Once again as it is with immigration, Republicans believe the appearance of a fight is tantamount to having one. Really? Then why did the Obama administration relinquish control of the Internet Corporation for Assigned Names and Numbers (ICANN) that manages Internet infrastructure to the so-called “global community” last March? Prior to that relinquishment the U.S. had always played the principal role in maintaining the master database for domain names, the assignment of Internet protocol addresses and other critical Web functions known as the the Internet Assigned Numbers Authority (IANA). Under the previous contract that expires next September, nations could only suppress Internet content, not the registration of domain names. If those parameters change, domain name registry could be censored under the auspices of protecting one’s national sovereignty. The ICANN Board of Directors insists any changes in the status quo will be approved by a “multi-stakeholder community” consisting of both private and government entities, but who’s kidding whom? How many private entities would be willing to go toe-to-toe with Vladimir Putin if he decided to institute another Internet blackout similar to the one he inflicted on a number of Internet sites in the Russian Federation prior to secession vote in Crimea? Immediately following yesterday’s vote, Wheeler tried to diffuse criticism. “No one, whether government or corporate, should control free and open access to the Internet,” he declared. “The Internet is too important to allow broadband providers to make the rules,” adding it was nonsense to characterize this effort as a secret plan to regulate the Internet. “This plan is no more a plan to regulate the Internet than the First Amendment is a plan to regulate free speech,” he insisted. Quite simply, that is a lie. Title II is a series of requirements imposed by government on Internet Service Providers (ISPs) that prevent them from blocking or throttling applications and websites, and charging them for prioritized access to consumers. It also allows the FCC to impose fines on companies found to be employing “unreasonable” business practices‚Äîas defined by the FCC itself. And while the agency promises it won’t impose price controls, Title II allows it to do so. In short, net neutrality is nothing less than the Obama administration’s determination to impose “social justice” on private companies because it would be “unfair” for them to treat some customers (read less profitable) less favorably other customers (read more profitable). There is little doubt the pernicious assumption underlying this effort is that Internet accessibility is a “right” rather than a privilege. A right that demands a radical egalitarian imposition of government controls, preventing companies from deciding who their most valuable customers are. It would be akin to the Obama administration demanding that every car manufactured in the United States be “no better or worse” than an Chevrolet Impala, because those who had the wherewithal to purchase a Lexus would get a car with better acceleration, thereby undermining Americans’ “equal access” to a thruway. Moreover, despite everything this administration, Democrats and their leftist media allies might say, the Internet has been a triumph of innovation and expansion for decades without the kind of limitations the FCC is now imposing. And that, in and of itself, is the genuine reality that grates against progressive instincts: there must be no such brilliance and innovation that remains beyond the yoke of government, lest the “greater good,” as it is defined by those very same statists, be so transparently threatened. Is there anything more typically progressive than a system of governance that imposes “demands” on the risk-taking, hard work and innovations of others? Next stop, the courts. The most recent decision on net neutrality was the DC Circuit Court ruling on Verizon v. FCC, vacating a de facto effort to impose net neutrality. The effort failed precisely because ISPs were not defined as common carriers and remained beyond the FCC’s power to regulate them. Yesterday’s vote changes that equation, but ISPs will litigate on the basis that the ruling constitutes dangerous government overreach. It is an overreach made possible by an out-of-control administration, and its Democrat allies. Both of whom are being aided and abetted by a deer-in-the-headlights Republican Party. Whether liberty itself can survive such a toxic mix remains to be seen. This entry was posted in Traitors and tagged FCC, Federal Communications Commission, Net Neutrality, Politician, Thomas Edgar "Tom" Wheeler, Tom Wheeler, Traitors, Treason. Bookmark the permalink.